Servers come in different shapes and sizes. They serve different purposes. Sometimes they are dedicated and sometimes they fulfill various tasks. A common impression of a server looks pretty much like the image on the left - hard drivers, a lot of circuit boards, numerous cables and a huge server rack to house it all. Curiously, this is Google's first production server (about 10 years old). 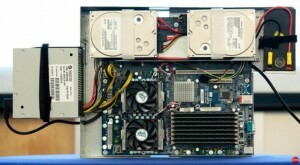 This server, along with about 30 others, is what allowed the company to grow big at a minimal cost. 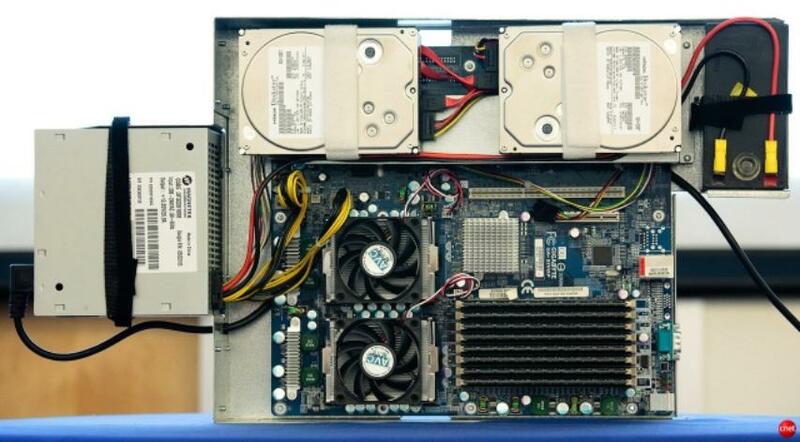 Earlier this year, Google revealed one of their long kept secrets - their server design. The servers look quite common and the most curious fact about them is that they have a built in 12 volt battery, in case there is a problem with the main power source. It turns out that built in backup power is not only cheaper but more efficient too. Google measured that server mounted batteries are able to reach greater than 99.9% efficiency, while conventional power supplies are only able to reach 92-95%. The server took Google's server designer Ben Jai 2 and a half years of hard work. Google have decided to use Gigabyte motherboards and both Intel and AMD processors, all x68. Now, gather 1,160 of these server units and you will get what Google call a Container Data Center. But where do you put that many server units? Well, you store them in a shipping container. The answer is so close that many people probably said to themselves "How didn't I think of that?". One container can store up to 1,160 units, with a total power consumption of 250kw. That is one data server, built do meet demand. But how is your server performing? Run a quick server test to find out.